For over ten years the members of 1592 have been immersed in the intense music scene of Detroit. Having played with a myriad of groups, they have come together to create a change in the music world. While other bands are content to strive for success, 1592 is bent on changing the pre-existing notions of the musical scene. With members that have recieved two Detroit Music Awards for Outstanding Reggae group, their blend of traditional music with newer technologies makes for an extremely groove oriented approach. 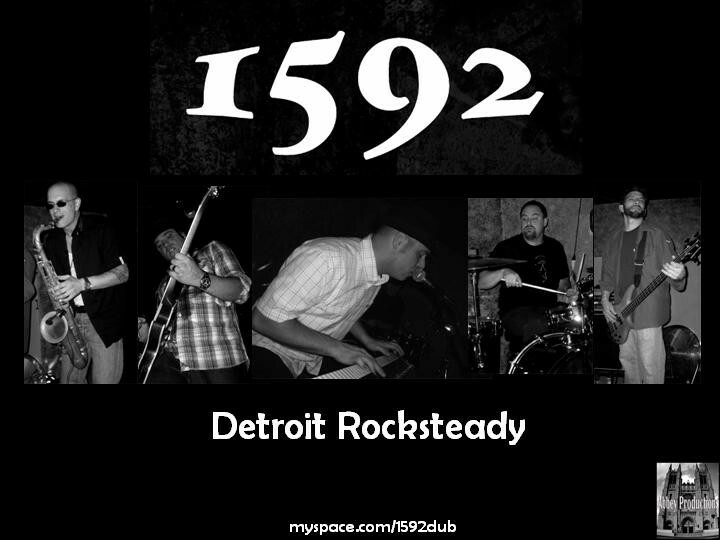 * Armed with the talent and knowhow of roots reggae and rock-steady 1592 are breaking new ground within the city of Detroit. * Consisting of musicians from surrounding musical scenes, this group is bent on impacting the reggae world with their indepth look at the original music. * Having played with groups such as The Skatalites, Toots and the Maytals and others of the original Jamaican sound, 1592 is determined to take a roots approach to the music that they love. So come check out the heavy beats of the newest sound in Detroit. Bent on making the audiences move and groove to the original sounds of Jamaica infused with the city of Detroit. ROCKSTEADY FOR THE MASSES and beyond.